My husband and his friend, Brian, used to always joke about the “Depot dogs” you could get outside of Home Depot. My primary response was “ew, who would possibly want to buy a hot dog at Home Depot? 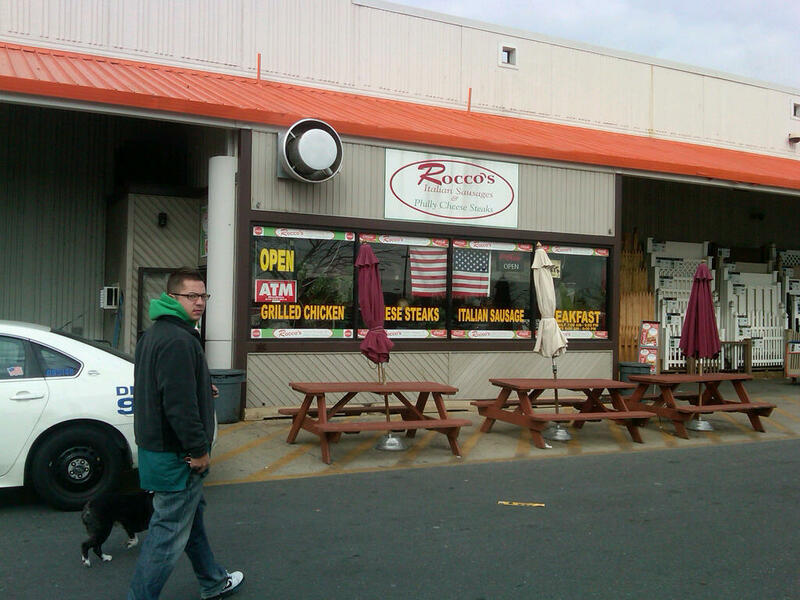 Home Depot is for things like paint and tools and drywall and such.” Recently, however, people have been all atwitter about Rocco’s Sausages located outside of three Home Depots in the Philadelphia area (literally atwitter–follow them at @RoccosSausages.) I usually get my weekend sandwich from The Sausage Truck at Headhouse Square (follow them on twitter too–@TheSausageTruck) but didn’t need anything from the Farmer’s Market so we thought we’d try something a little different. After a detour past Wawa for a cup of coffee (I wonder if Wawa is on twitter,) we pulled into the Home Depot lot and headed towards the stand. While my husband waited outside with the dog, I walked in with his order in tow. As soon as I entered the premises, the friendly gentleman behind the counter offered me “a sample, miss.” Anyone who calls me Miss gets a thumbs up in my book, but I was distracted by intense taste of the sausage. I was sampling the spicy sausage and the flavor emanated throughout my mouth and remained a little tingle after it went down. I tasted a slight hint of fennel too, and the sausage was nicely browned on the outside without being too charred and was perfectly juicy on the inside. I was sold. 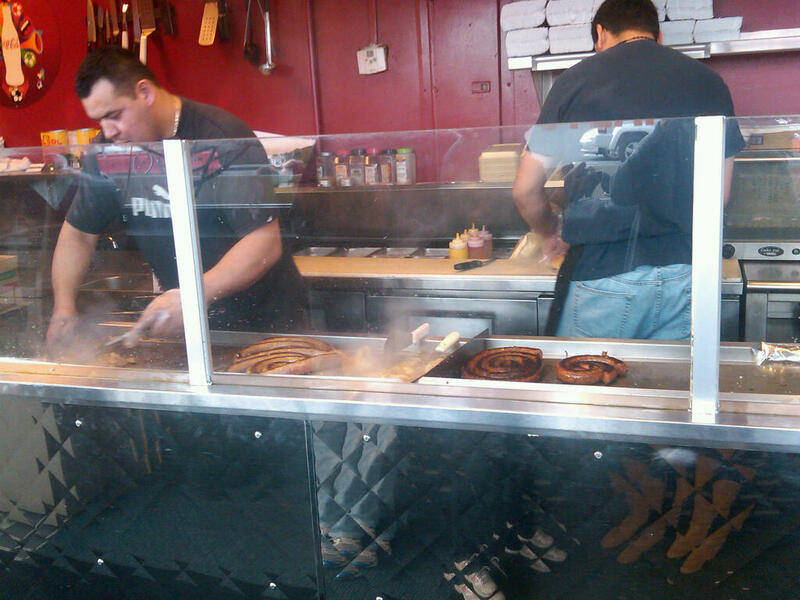 I went with the hot sausage with peppers and onions and got the sweet sausage for my husband. I grabbed a bag of chips for us to share and the guy tossed another one in my bag “on the house.” I went outside and we settled at one of the umbrella table outside the store. 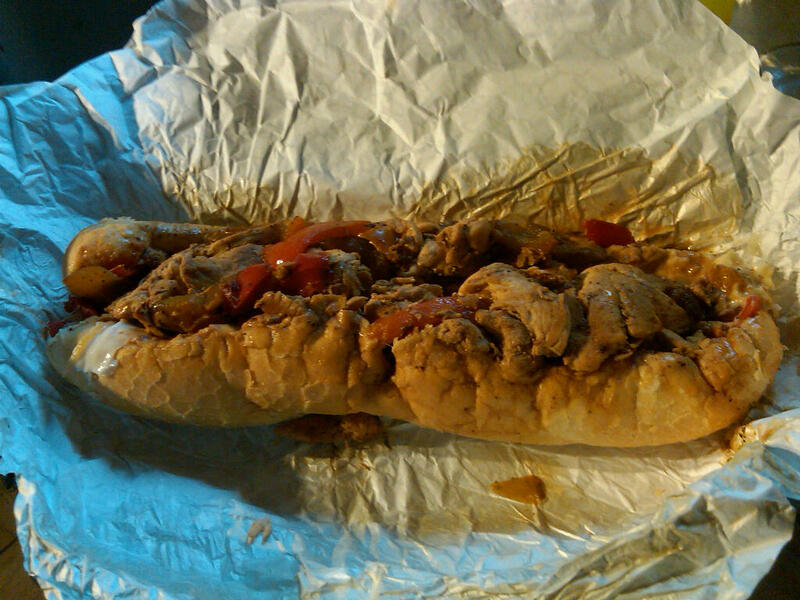 This was the spicy sandwich–not that it matters, they both looked the same. I love, love, love lots of toppings and this sandwich was just dripping with sauteed onions and peppers. And a close up. That’s a lot of sausage for one gal! As usual, I couldn’t resist and shared a little bite of the meat with my dog. 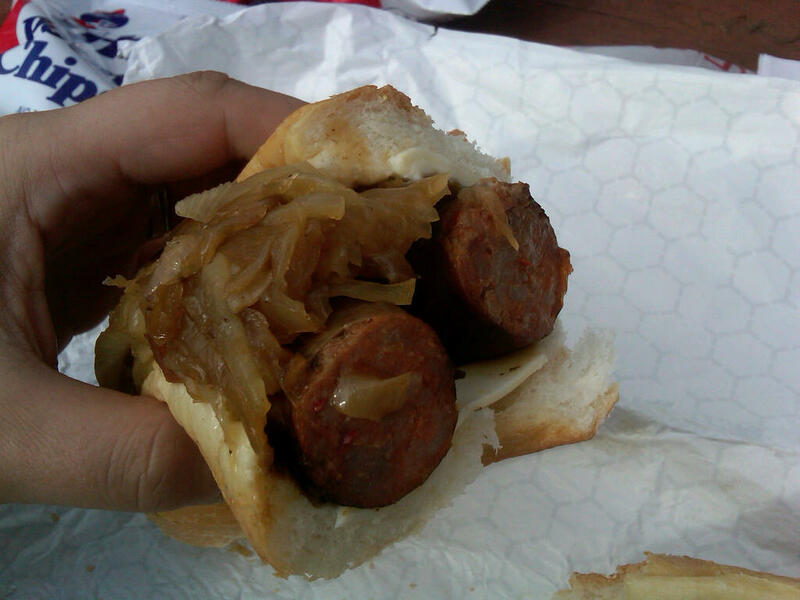 The sausage sandwiches were both outstanding–rich, juicy and full of flavor. A word of warning–the spicy is definitely spicy so be sure you’re up to it before you order. I finished off a half and wrapped the other one up for later. A few hours later, I was hanging out with my dad and sister who happened to be hungry and I thought–why not?–we ended up back at Rocco’s. The gentleman looked at me quizzically when I returned so I let him know that “I liked it so much I brought my family back!” My sister was also handed a sample and decided to go with the sweet sausage. 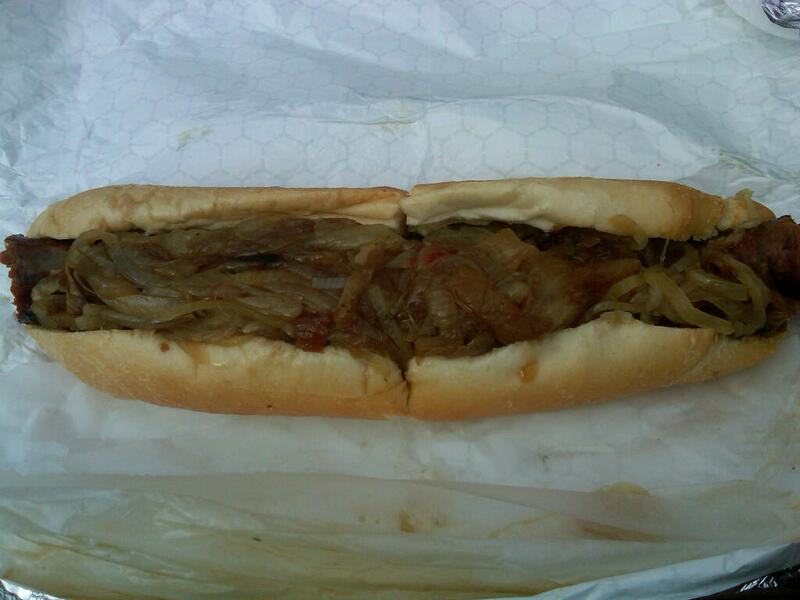 My father, on the other hand, keeps his own special version of kosher and ordered a chicken cheese steak. Because I was a little more comfortable, I snapped a shot of the action. Look at those nice hunks of chicken meat!